Entrance to Leslie from east. 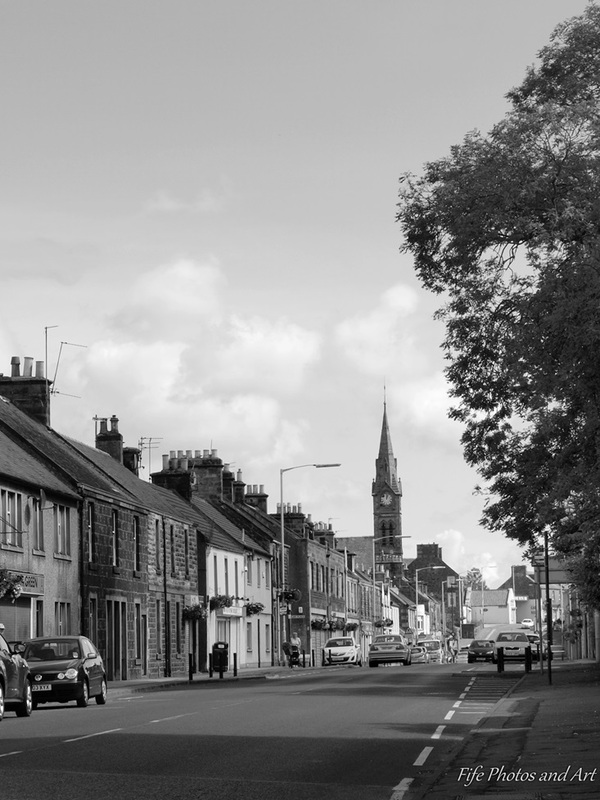 Unfortunately, with the big supermarkets in Glenrothes, Leslie has gone the way of many villages on the outskirts of large towns, only having 3 or 4 small shops selling groceries, a couple of newsagents, quite a few pubs and takeaways, and one or two other small shops. Even the post office has shut down over the last couple of years, thanks to the privatization of Royal Mail. The origins of the name start with a Flemish or Hungarian trader known as Bartolf, who arrived in Scotland with Queen Margaret in approx 1060 AD. He was later appointed as Governor of Edinburgh Castle by Queen Margaret’s husband, King Malcolm III, and changed his family name to Bartholomew after being granted estates at Leslie, in Aberdeenshire. In 1070 AD he married the King’s sister, Beatrix, and thus founded the family of Leslie. 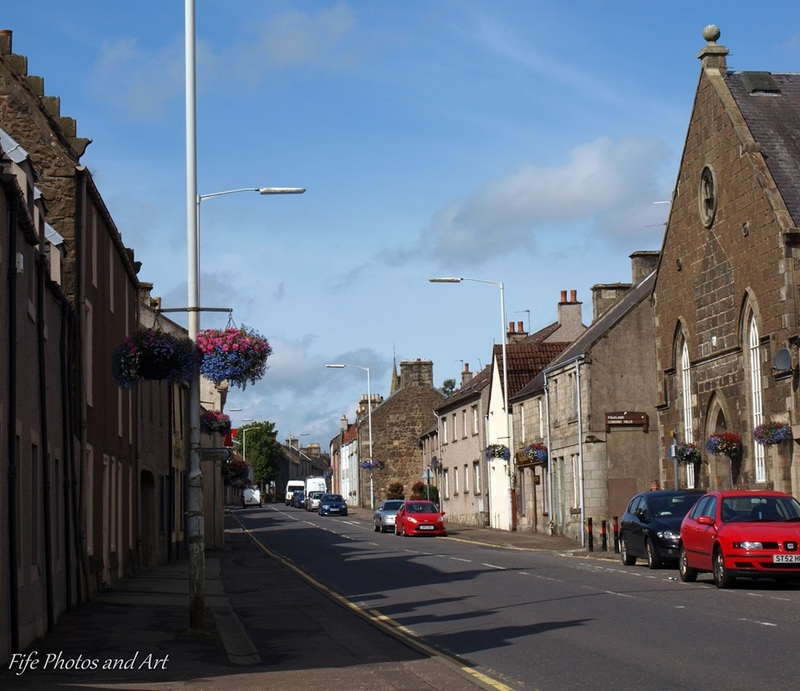 In 1283 AD, a descendant of Bartholomew, Norman de Leslie was granted land around what was then known as Fetkill or Fythkill (the area on the east side of Leslie is now known as Fettykill) in Fife, by King Alexander III of Scotland. The settlement continued to grow as Fythkill until around 1455, when it was renamed to Leslie after the then laird, Sir George Leslie. 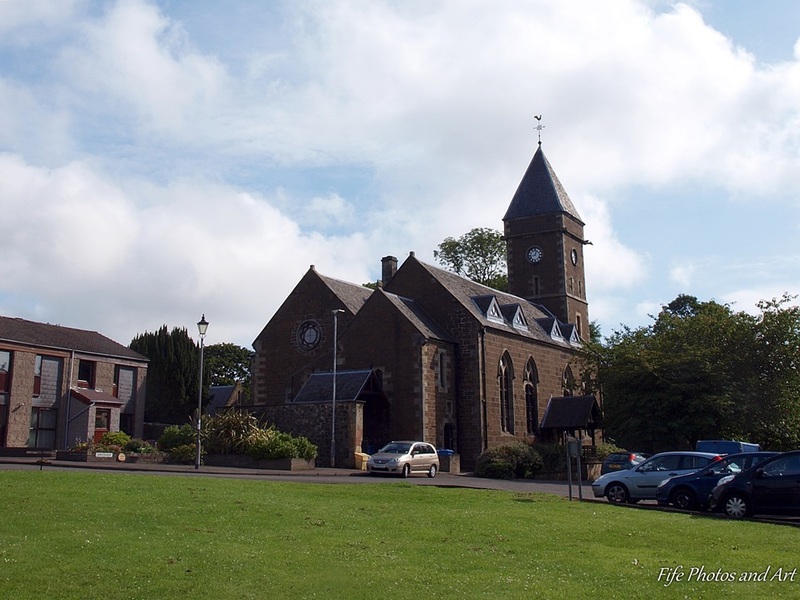 Two years later, he was given the title of 1st Earl of Rothes, and the following year in 1458, Leslie was awarded ‘Burgh’ status by King James II of Scotland. This allowed the community of what was now known as Leslie to hold two market days annually, the first in April and then once again in October. Unlike the royal ‘burghs’, however, they were not allowed to participate in foreign trade, hence very few ordinary ‘burghs’ developed into market towns. From the late 15th Century to the mid 18th Century, most of Leslie’s inhabitants were either involved in farming or the weaving trades. Farming generally took place at the backs of the houses, on a long thin strip of land known as a ‘rood’, which was approx a quarter of an acre of land. This land was used to grow vegetables and keep a few animals. Rent was paid to the ‘feu superior’, in this case, the Leslie family. From a charter in 1627, it can be seen that some families paid a lifetime rent on their land, whilst others paid an annual fee consisting of capons, chickens and hens. Only certain families were named on the Leslie Charter of Burgh and they were the only people allowed to have the right to take part in the running of the community. This led to many arguments within the Leslie community, many of which had to be settled in court. One of the oddities of this setup was that the houses (known as Douglas Croft) on the west side of Leslie Green were owned by the Douglas’s of Strathendry, so their inhabitants had to pay a yearly fee to step outside their front doors, as this was common land controlled by the Leslie Burgh Charter families. In 1667, the 7th Earl of Rothes, John Leslie was appointed to the post of Lord High Chancellor by King Charles II, and three years later he was promoted to 1st Duke of Rothes. At this time, John Leslie started work on Leslie House on the eastern edge of Leslie. Work was completed in 1672, and the house consisted of four wings surrounding a courtyard, and was such a grand house it was said to rival Holyrood Palace in Edinburgh. Unfortunately, much of the building was destroyed by fire in 1763, with only the west wing surviving. This was then destroyed, again by fire, in 2009 and all that remains of this once magnificent building is a burnt out shell. John Leslie was the only Duke of Rothes, but since he had no male heirs, only the title of Earl could be transferred to his oldest daughter. 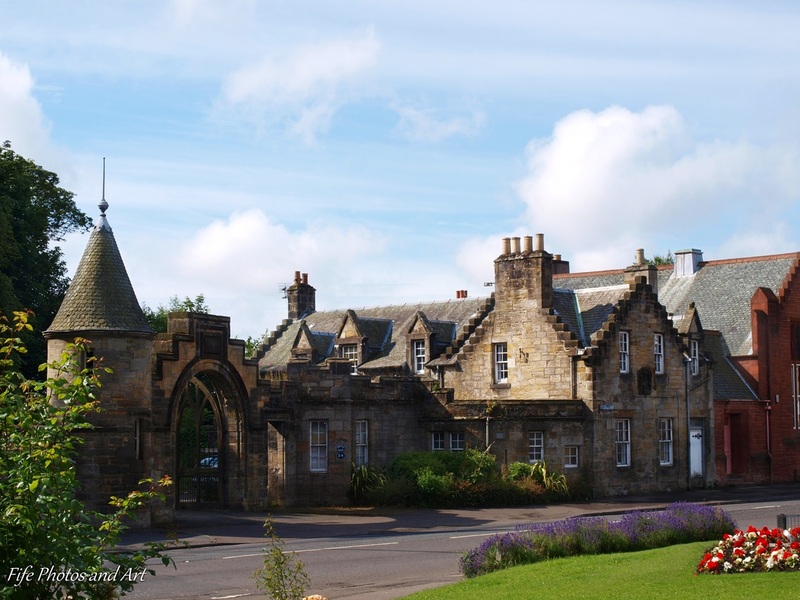 From Leslie High Street, the best bits of evidence of the existence of Leslie House are in the form of the elaborate gate posts and entrance lodge. The fast flowing River Leven on the south side of the village led to the development of textile mills along its length in the late 18th century, and by the mid 19th century, more than 2000 local people were employed in the production of linen, cotton, flax and lint. Steam power, rather than water power drove the mills from approx the 1830’s. The village/town even produced snuff during this period of time. 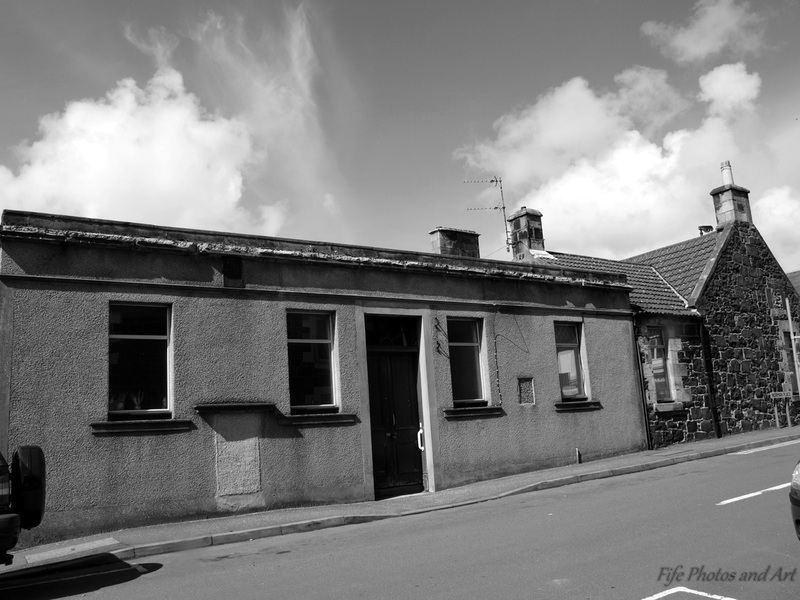 Leslie also expanded to the west at this time, with the development of Prinlaws, houses built for the workers of the John Fergus’ mills. 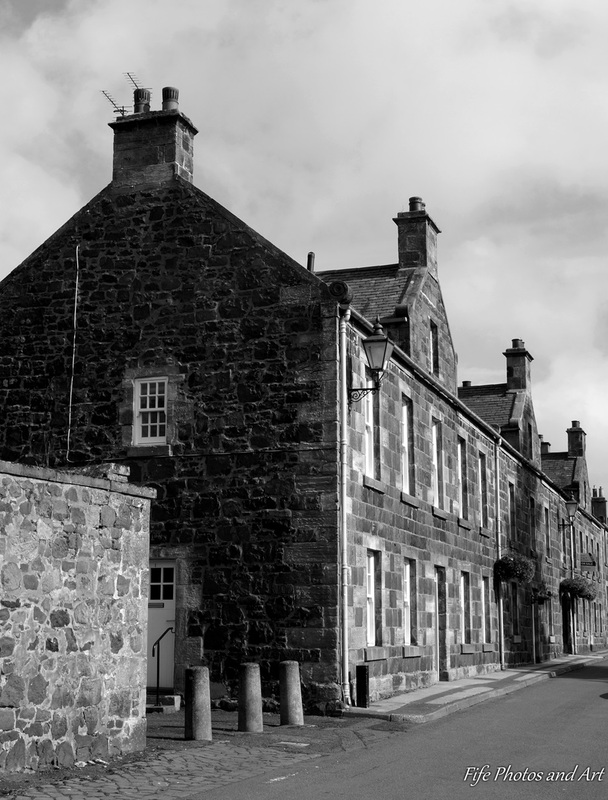 These mills, like those of the now ‘World Heritage Site’ at New Lanark, near Glasgow, provided housing of a better quality than the existing houses in Leslie, and they also provided education for both children and adults. By 1860, however, the textile industry was in decline, and this saw the advent of a new industry in Leslie, paper manufacturing. 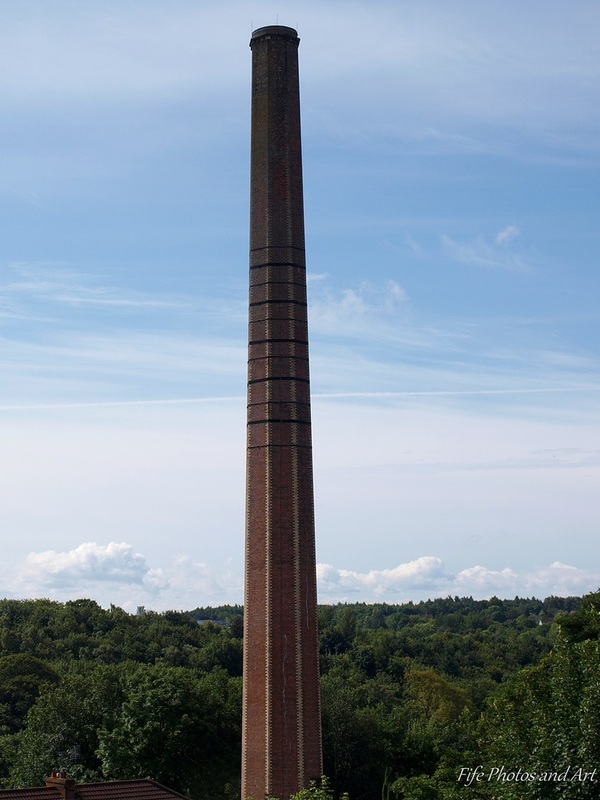 Charles Anderson set up a partnership to operate a new paper mill on the banks of the river, known as the Fettykill Mills, which benefited the people of Leslie with extra jobs, but did create an extra hardship for those folk living on the south side of the village. Prior to water being plumbed into houses, everyone on the southern side of Leslie High Street would collect their water from the River Leven, but the new mill owners now denied permission to access the river, so the house owners now had to collect their water supply from the Camby Burn on the north of the village. 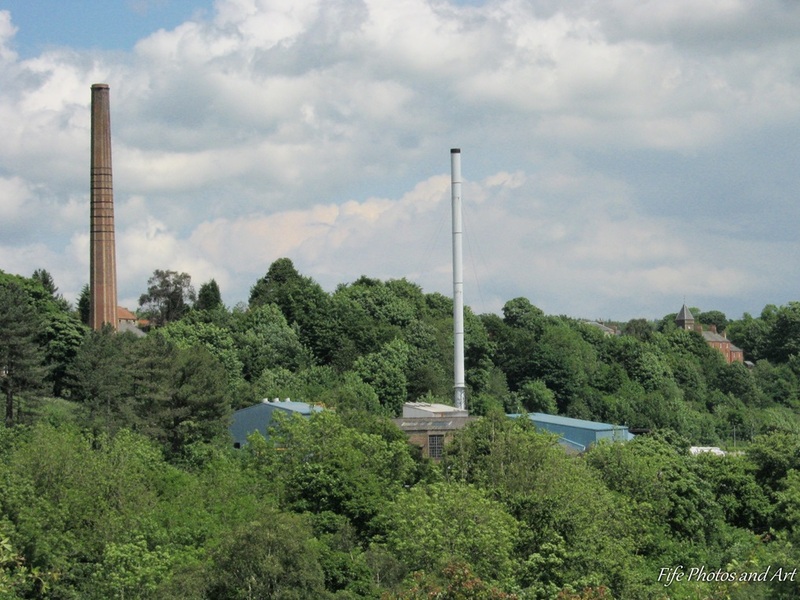 The different mill owners did however, provide funding for many sports and social events, for the benefit of the community. 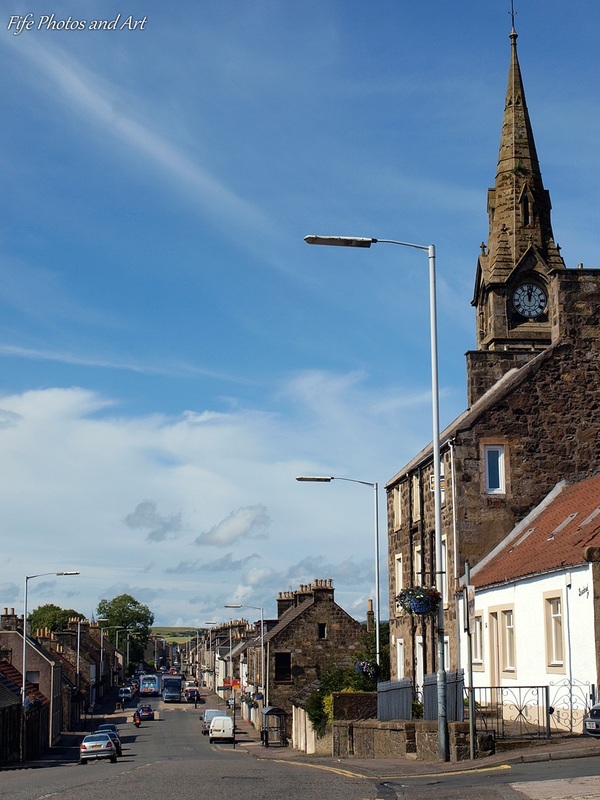 In 1861, the railway arrived in Leslie, albeit by a circuitous route from Markinch. 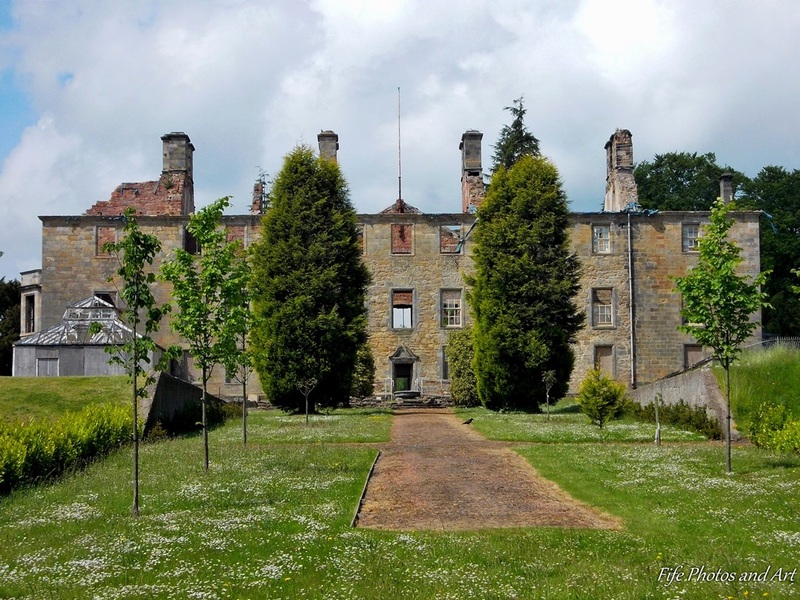 The Countess of Rothes, Henrietta Anderson Morshead Leslie, or maybe her father, the 16th Earl of Rothes, insisted that the railway went nowhere near Leslie House. Evidence of the railway, which shut in the mid 1960’s, can still be clearly seen in the form of the 14 arch Cabbagehall Viaduct which crosses the River Leven approx half a mile west of Leslie house. The old railway line is now used as the Boblingen Way around the southern parts of Glenrothes, a pleasant walkway around the town. 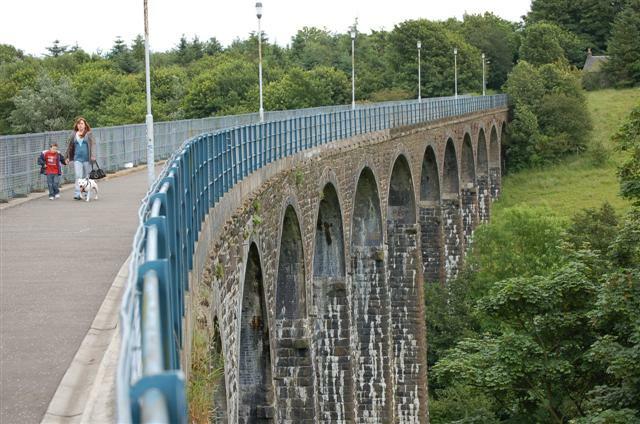 Cabbagehall viaduct from Leslie. Photo by by Paul McIlroy. Licensed under CC BY-SA 2.0 via Wikimedia Commons. 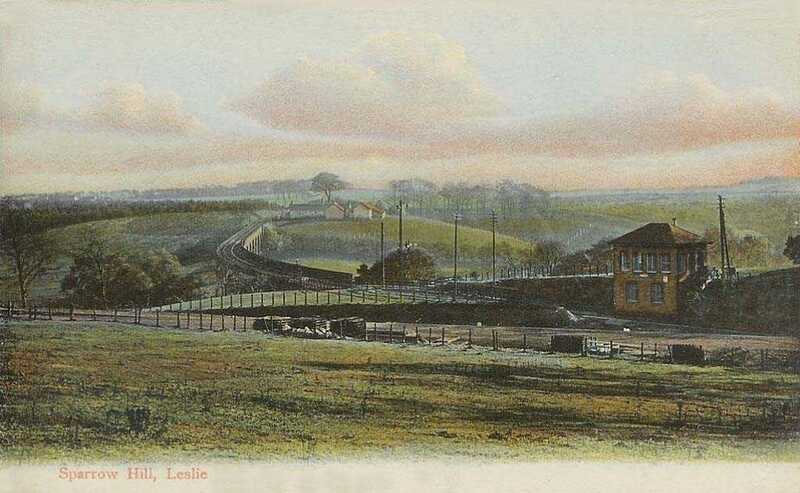 View of Leslie railway c1900’s. Image from Old UK Photos. Leslie Green is at the east end of the village on the road to Glenrothes. This was the focal point of community, the site being used for fairs and the weekly markets. 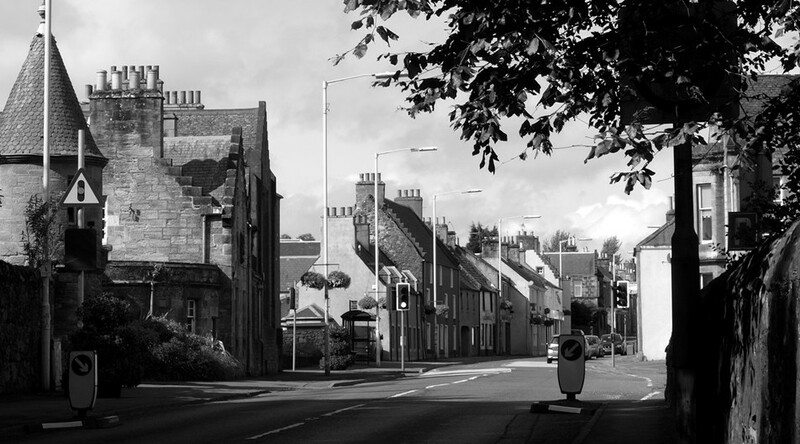 Nowadays, any fairs or events occur on the back braes on the north side of the village. The Green has the houses known as Douglas Croft on one side, these are some of the oldest surviving houses in Leslie, and the Christ Kirk (‘kirk’ is the Scottish name for church) at its head. This was converted to flats in 1993. 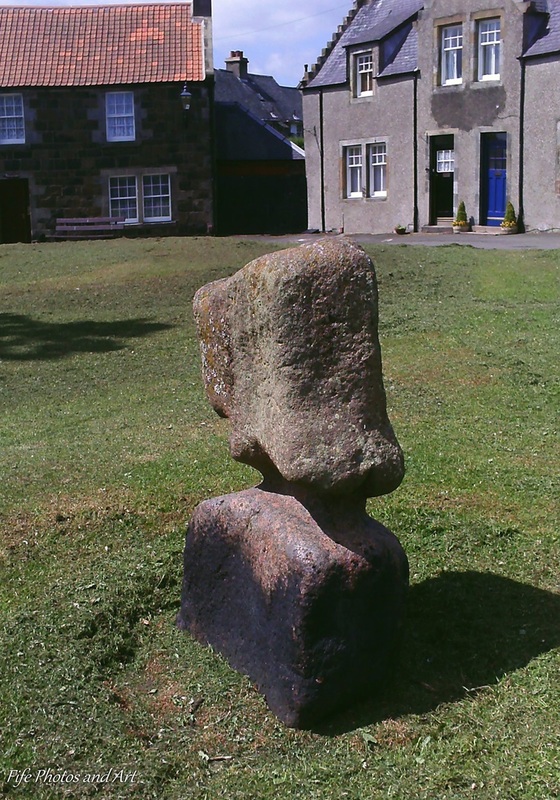 An interesting feature of the far end of Leslie Green is the Bull Stone. This one metre tall piece of well worn granite was supposedly used to tether bulls for bull-baiting, a rather barbaric practice held during the fairs at the Green in the 16th, 17th and 18th centuries. The heavily worn groove near its centre was formed, by the ropes tethering the bulls, whilst they were attacked by the dogs. 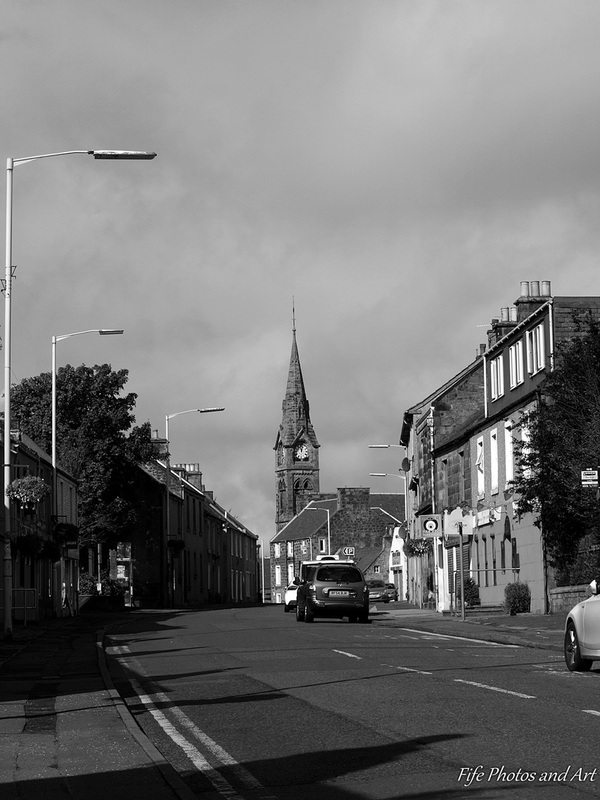 Below are two more photos of Leslie High Street and a photo of the Catholic church of St Marys and St Paul. 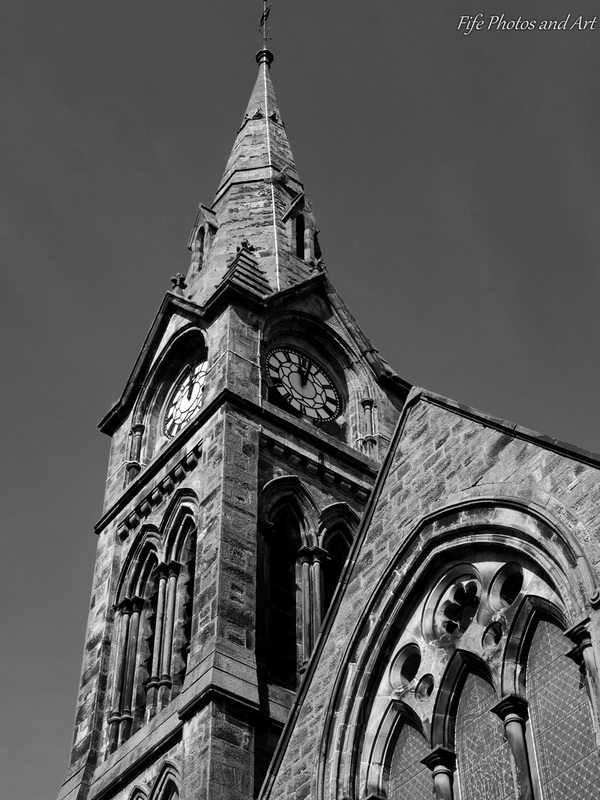 This entry was posted in Architecture, Fine Art Photography, History and tagged Fife, Glenrothes, Leslie, Scotland. Bookmark the permalink. Lovely photos. I am so glad I happened upon your blog today. 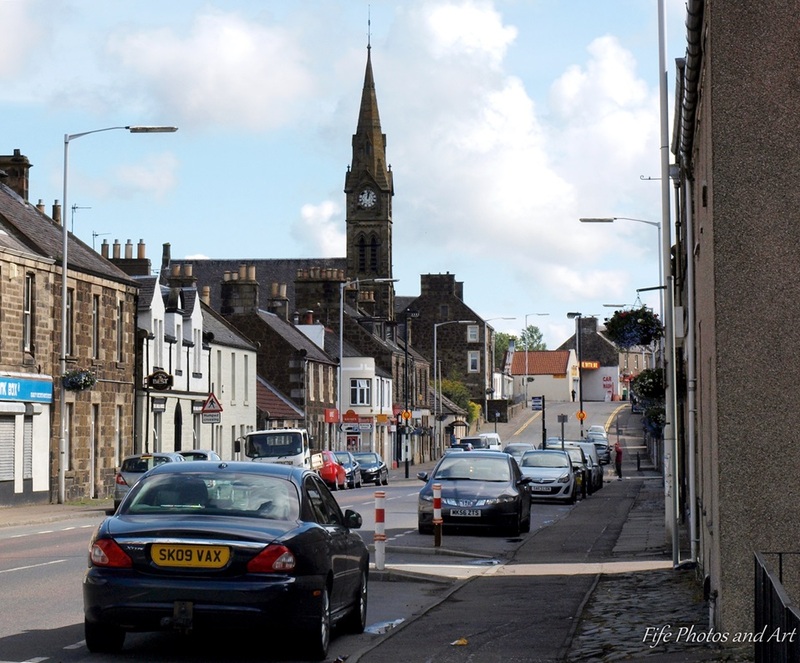 I am from Fife and was just back there visiting family recently, taking my kids around many of the places I used to enjoy visiting when I was growing up there. Now your blog can feed my nostalgia and bring back memories. Thanks Laura, I’m glad you like the blog. I’ll be posting at least once a week, hopefully more than that on some weeks. Great. Your blog posts will help quell my bouts of homesickness. By the way, your own blog, ‘A Pict in PA’, is very good. I enjoyed the post about Kilmartin, it’s somewhere I’d love to go down and see. Thank you very much for visiting and for the Follow. I highly recommend Mid-Argyll for a trip, especially given you are a photographer. I will happily give you a long list of wonderful spots for photography should you decide to go. Thanks Laura for the offer of great photography locations in Mid-Argyll. I can’t see us making it down there in the very near future, but hopefully by next summer we may have the time for such a trip.